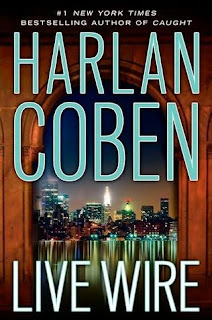 I've been anxiously waiting for the release of Harlan Coben's new MYRON BOLITAR mystery, Live Wire. Chapters has been quite unreliable with my pre-orders, so when we were in Toronto, I picked up a copy. Of all the writers, and all the series, in all of the world...Coben's invention of Myron and Win are my MOST FAVOURITE! So much, in fact, that I've written a post about them before. Now, I can't say that this was the BEST Bolitar mystery, but it was still really good. All the main players were there: Win - the amazing old-money ninja, Esperanza & Big Cyndi. 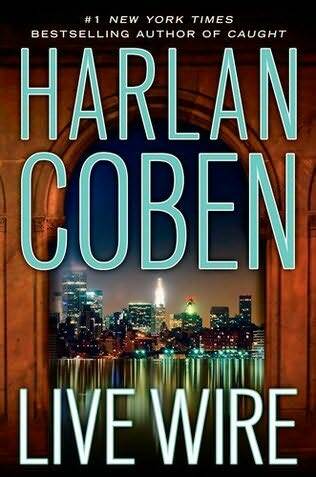 I've read EVERY Bolitar mystery thus far, but thought that the talented Mr. Coben had retired good ole' Myron but NO!! He's BACK! For those who know of the pro-basketball-player-turned-sports-agent, his clients often get him involved in private detective-like activities, with the backdrop being a specific sport. A basketball player needing help means there's a lot of basketball. A baseball player needing help means there's a lot of baseball. Well, LIVE WIRE starts off with a former tennis player needing some assistance, but this book isn't about tennis. It's actually about music. Way to mix it up, Mr. Coben! I found the plot to be slightly less complicated than others, but it was great read nonetheless. I suspect that although Myron's slated to get married, he may not. Jessica, his slightly bitchy ex, was a favourite character of mine, but now she's looooooong gone. There was a storyline that I hadn't remembered from waaaaaaay back too, concerning Myron's family, and it was interesting to read, but didn't really add to the main plot (for me, anyway). The book has an open enough ending that another in the series could emerge, but (and it PAINS ME to say) it may be time to retire the character. Myron and Will aren't spring chickens anymore and some of the pop culture references are fly way over my head (aside from the couple of Jersey Shore shout-outs, which were unexpectedly hilarious). If you're a die-hard fan, then clearly this book is in your collection. If not, I'd STRONGLY suggest that you pick one up, but not this one because you'd like it better if you had the background info. ps. I find it QUITE challenging to write a review WITHOUT spoilers. As such, this reads as somewhat vague, but I don't want to ruin the book for anyone. So, you're welcome for the glossing-over.